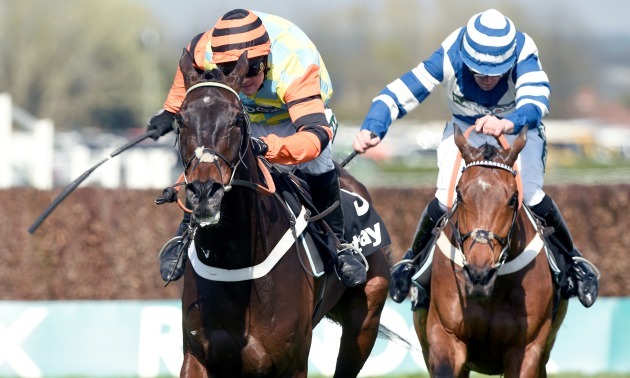 We take a look at three of the most in-form trainers at present that could be worth keeping an eye on in the coming weeks. 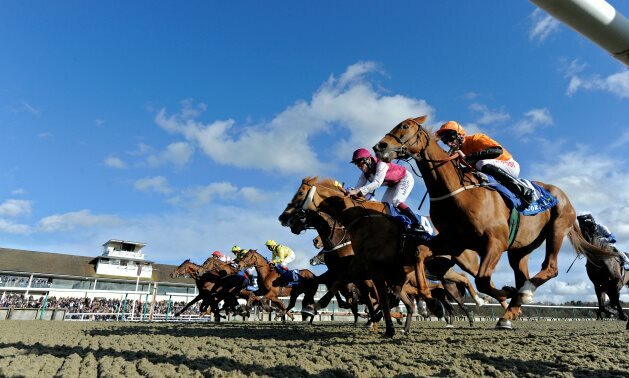 There is no trainer on the Flat in better form – on Timeform’s scale – than George Baker at present and he has some interesting fancies heading into next week. 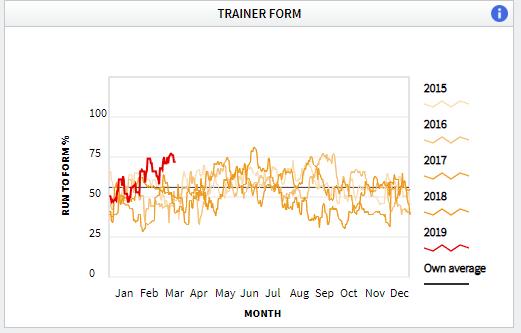 The graph below will also attest that Baker himself hasn’t been in this sort of form for a while, giving more reason to follow his runners closely over the coming days. Baker could send three runners to Lingfield on Monday, with Confrerie, The Lamplighter and Atomic Jack all holding entries. All three will have solid chances, too, but the pick could be Confrerie, who looks well handicapped at present. He won a handicap at Brighton from 3 lb lower in October and shaped as though he’d come on for the run after three months off at Kempton recently. On the pick of his form, he should be well up to making his mark here. 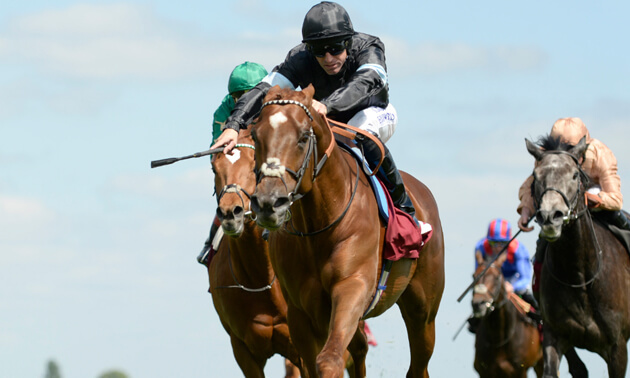 On Wednesday, The Gates of Dawn could make his reappearance in the seven-furlong handicap. 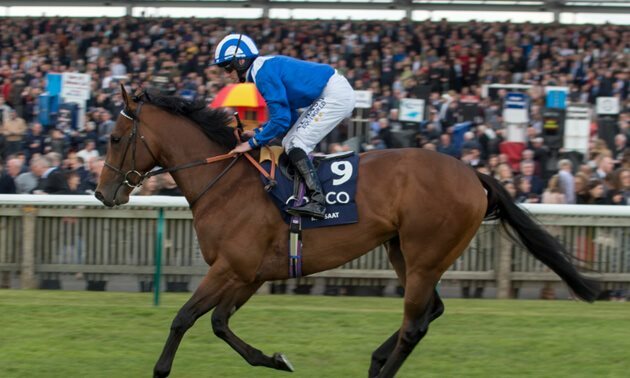 Admittedly, he is yet to fully fire since making the move from France last season, but his best effort to date came at the track and he should have no problem stepping back up in trip. If returning to his best form in France, he should be up to winning races from a BHA mark of 81. Emma Lavelle must still be on cloud nine following Paisley Park’s victory in the Stayers’ Hurdle at the Cheltenham Festival, and the yard continues to thrive, so with plenty of entries in the coming week, she remains a trainer to keep on side. Lavelle has declared three runners at Exeter on Sunday, namely Misty Bloom, Reelingtheyears and Fortunate George. The second-named looks interesting having won a maiden hurdle at Chepstow around this time last year and shaped better than the distance beaten on handicap debut when last seen in April. Fitness shouldn’t be an issue on his return from nearly a year off the track and he rates the type that could have even more to offer. Fortunate George is also of interest switching back to fences. He turned in his best effort of the season over hurdles at Newbury earlier this month and he shouldn’t be underestimated back over fences able to race from a 7 lb lower mark. 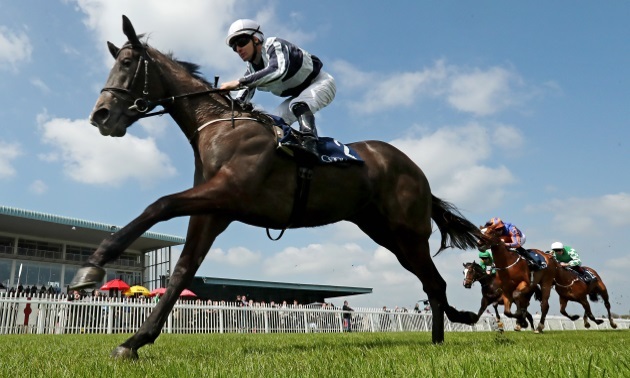 Lavelle has plenty of interest elsewhere throughout the remainder of the week, though seemingly none with leading chances, Balibour at Market Rasen on Wednesday perhaps one of her most interesting entries. He ran poorly when pulled up at Wincanton when last seen but judged by his third-placed finish at Fakenham the time before he should be competitive. Brian Ellison is a recognised dual-purpose trainer, and he has been having a good time of things of late, especially in the National Hunt sphere. Bordeaux Bill landed the feature race at Sedgefield for him on Thursday and, although he hasn’t an abundant of runners entered for next week, there are still a couple that are of interest. Snookered has been running well since returning from a short break earlier this month and should again give another good account if taking his chance at Hexham on Tuesday. He returned to somewhere near his best form with the cheekpieces back on at Wetherby last time and could yet have more to offer. Siannes Star is another who took a step back in the right direction when hitting the frame at Market Rasen earlier this month. 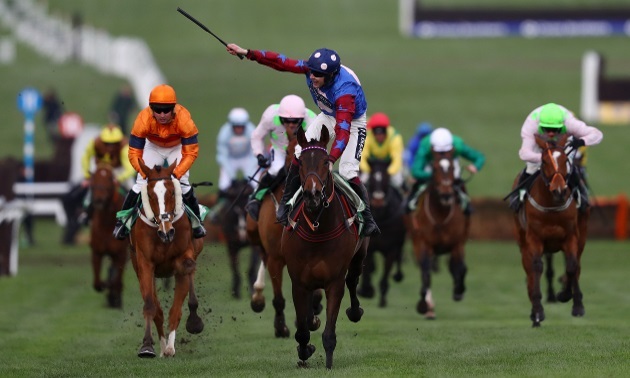 She could return to that course on Wednesday where she is entered for a handicap over two and a quarter miles. Given she was too free over two miles last time, she will have to settle better, but she has run well over even further in the past and looks on a workable mark at present. Ellison could also have a runner on the Flat on Wednesday at Southwell in the shape of Skyva. He ran respectably in a first-time visor at Newcastle when last seen in January and has run well on the fibresand before, so will be no forlorn hope if taking his chance.